"Camphorwood" redirects here. For the Australian tree also known as Camphorwood, see Cinnamomum oliveri. Camphor laurel contains volatile chemical compounds in all plant parts, and the wood and leaves are steam distilled for the essential oils. Camphor laurel has six different chemical variants called chemotypes, which are camphor, linalool, 1,8-cineole, nerolidol, safrole, or borneol. In China, field workers avoid mixing chemotypes when harvesting by their odour. The cineole fraction of camphor laurel is used in China to manufacture fake "Eucalyptus oil". The chemical variants (or chemotypes) seem dependent upon the country of origin of the tree. 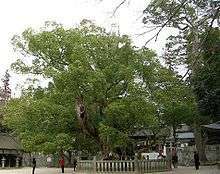 The tree is native to China, Japan, and Taiwan. It has been introduced to the other countries where it has been found, and the chemical variants are identifiable by country. e.g., C. camphora grown in Taiwan and Japan is normally very high in linalool, often between 80 and 85%. In India and Sri Lanka, the high camphor variety/chemotype remains dominant. C. camphora grown in Madagascar, though, is high in 1,8 cineole (averaging between 40 and 50%). The essential oil from the Madagascar trees is commercially known as ravintsara. C. camphora is native to Jeju off the coast of Korea, Taiwan, southern Japan, southeast China, and Indochina, where it is also cultivated for camphor and timber production. The production and shipment of camphor, in a solid, waxy form, was a major industry in Taiwan prior to and during the Japanese colonial era (1895–1945). It was used medicinally and was also an important ingredient in the production of smokeless gunpowder and celluloid. Primitive stills were set up in the mountainous areas in which the tree is usually found. The wood was chipped; these chips were steamed in a retort, allowing the camphor to crystallize on the inside of a crystallization box, after the vapour had passed through a cooling chamber. It was then scraped off and packed out to government-run factories for processing and sale. Camphor was one of the most lucrative of several important government monopolies under the Japanese. 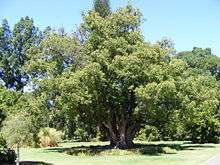 Camphor laurel was introduced to Australia in 1822 as an ornamental tree for use in gardens and public parks. It has become a noxious weed throughout Queensland and central to northern New South Wales, where it is suited to the wet, subtropical climate. However, the tree provides hollows quickly in younger trees, whereas natives can take hundreds of years to develop hollows. Its massive and spreading root systems disrupt urban drainage and sewer systems and degrade river banks. Its leaves have a very high carbon content, which damages water quality and freshwater fish habitats when they fall into streams and rivers. The camphor content of the leaf litter helps prevent other plants from germinating successfully, helping to ensure the camphor's success against any potentially competing vegetation, and the seeds are attractive to birds and pass intact through the digestive system, ensuring rapid distribution. 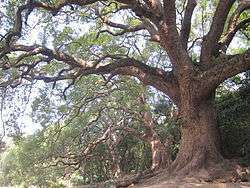 Camphor laurel invades rainforests and pastures, and also competes against eucalyptus trees, certain species of which are the sole food source of koalas. 1 2 Xi-wen Li; Jie Li; Henk van der Werff. "Cinnamomum camphora". Flora of China. Missouri Botanical Garden, St. Louis, MO & Harvard University Herbaria, Cambridge, MA. Retrieved 27 March 2013. ↑ Hirota, N. and Hiroi, M., 1967. ‘The later studies on the camphor tree, on the leaf oil of each practical form and its utilisation’, Perfumery and Essential Oil Record 58, 364-367. 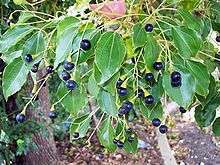 ↑ "Plants Profile: Cinnamomum camphora". Natural Resources Conservation Service. United States Department of Agriculture. Retrieved 12 April 2010. ↑ Forest Starr; Kim Starr; Lloyd Loope (January 2003). "Cinnamomum camphora" (PDF). United States Geological Survey: Biological Resources Division. Hawaiian Ecosystems at Risk project. Retrieved 12 April 2010. ↑ Wells,A., Edwards,E.D., Houston,W.W.K., Lepidoptera: Hesperioidea, Papilionoidea, Volume 31, CSIRO, 2001. Wikimedia Commons has media related to Cinnamomum camphora.